Engineering software may well be considered as one of the oldest areas of programming. In over than half a century it gave us discoveries and inventions that have dramatically influenced our whole environment: from electric kettles to aircrafts. The scope of academic and technical knowledge accumulated in the industry sets a high entry threshold - for individual developers as well as entire companies or research groups. No wonder there are only few major "epicenters" of developing engineering software in the world, historically related to certain schools of thought. Boston undoubtedly is one of such places. 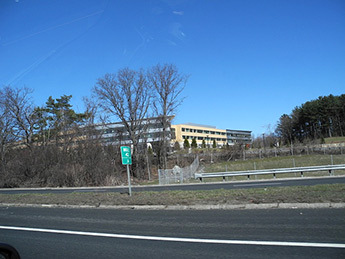 To be more precise, Greater Boston with its PLM-highway, the CAD cradle - Massachusetts Institute of Technology, revolutionary ideas of ComputerVision, PTC, and SolidWorks, numerous small start-ups and spin-off companies, as well as (saying it without false modesty) - a recently established US office of LEDAS. Obviously, when planning the Novosibirsk - Scottsdale (Arizona) itinerary for participating in the famous COFES-2013, I did not hesitate to go on a small detour and try to feel the atmosphere of Boston, in many aspects a unique city. Some personal impressions on the CAD-relevant issues - see below. Why is COFES organized in Arizona rather than in Boston? Brad Holtz, the President of Cyon Research and COFES organizer, gives a simple answer: Arizona is warm and sunny, the weather is stable plus there is an obvious effect of remoteness from work, which enables to take mind of routine things and fully concentrate on communication, which is of the most importance at COFES. Having spent a few days in New York before Boston, the contrast was obvious to me: the largest metropolitan city in the world and a light, spacious university campus. 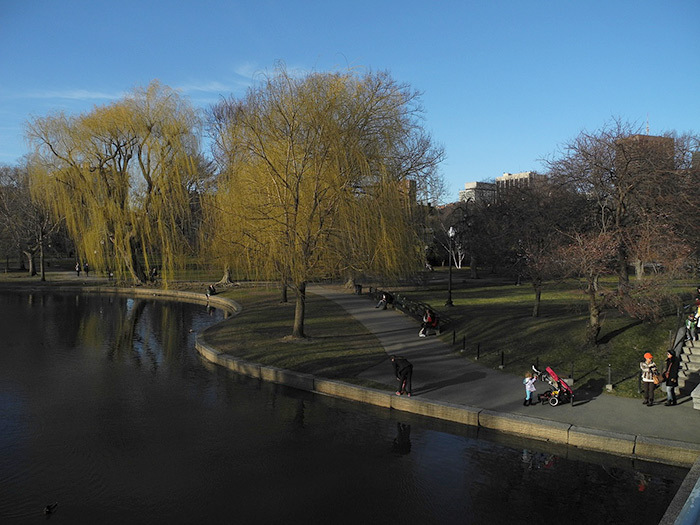 From the outset, it is possible to fall in love with Boston. I admit, there was a temptation to seat oneself somewhere on a bench and, like in the past student years, read books on mathematical analysis and higher algebra. Or in the worst case scenario - find some not-so-well-paid job at MIT and spend evenings in the lecture halls solving tasks that even the Fields Medal winners could hardly solve. 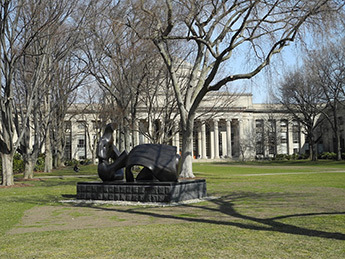 Left: one of the buildings of Massachusetts Institute of Technology (MIT) that became the CAD cradle. 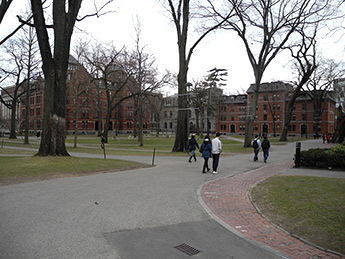 Right: Harvard campus. Both famous universities are located in Cambridge, near Boston (do not confuse it with the British Cambridge!). Boston Common in the evening, April 6. 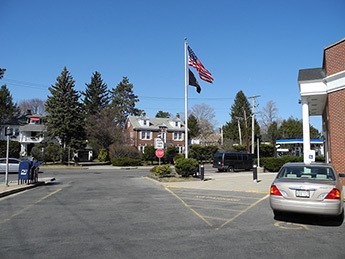 In a week, a terrorist attack would take place during the Boston marathon only several hundreds meters from the place shown on the picture. 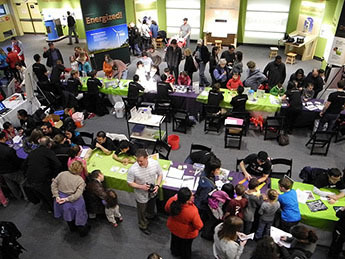 Science Museum is among the must places for visit in Boston. It is, certainly, designed for general development of schoolchildren. However, their curious parents also will find plenty of interesting things there. Interestingly, several years ago when I was on one of my business trips to Dassault Systemes, I happened to walk up to a similar Museum of Science and Technology in Paris... In short, I am nearly ready to prove correlation between existence of such a museum and the level of technological effectiveness in a particular geographical location. 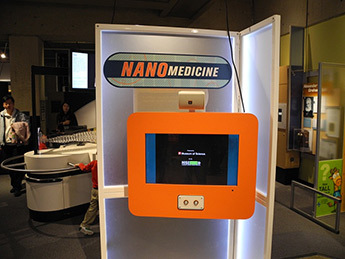 The so-called "nano-days". 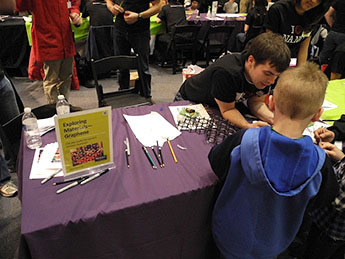 As is well known, "if you can't explain a concept to a 6 year-old, you don't fully understand it". 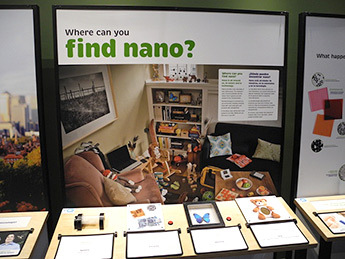 Obviously, students and post-graduate students from local universities fully understand physics of nano-phenomena and tell schoolchildren about it. For example, on the left picture they discuss the graphene structure, for experiments on which two British scientists of Russian origin (Geim and Novoselov) were awarded the Nobel Prize. 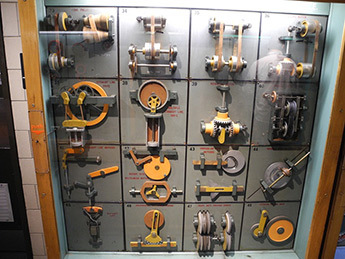 The stands show different types of kinematic connections and chains. With certain nostalgia I remembered the time when LEDAS programmers and mathematicians developed and adjusted the algorithms of a geometric solver and collision detection to model kinematics of mechanisms. 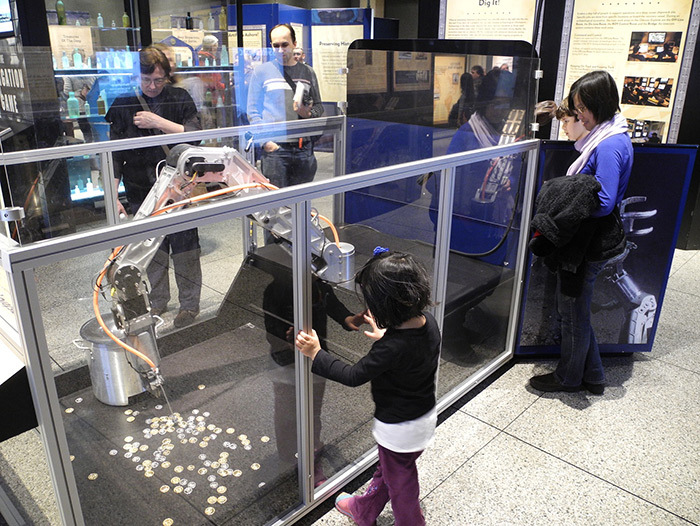 An inverse kinematics problem - to get a coin from the floor - must be solved manipulating a robot hand manually. Looking at unsuccessful attempts, I again remembered how we were solving the same task in the context of the geometric solver. Naturally, it fell into my mind to automate the money collection process. A mouse, a keyboard and even a "touch-screen" are not the only possible methods of communicating with a computer. 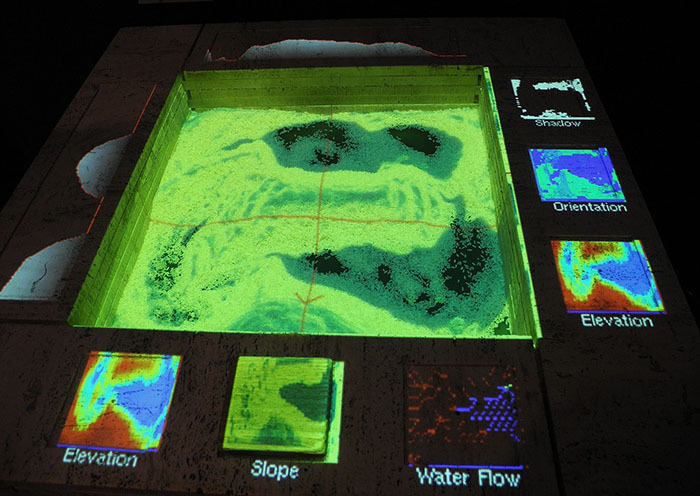 Here, for instance, hills are constructed using rice grains and then the surface form is transferred to the computer. The advantages of such information input are unclear, but pleasant tactile sensations are surely guaranteed. 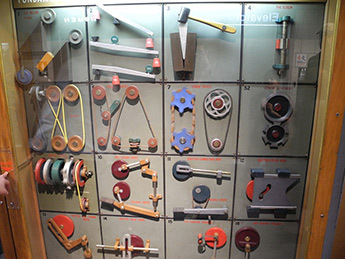 MIT museum. 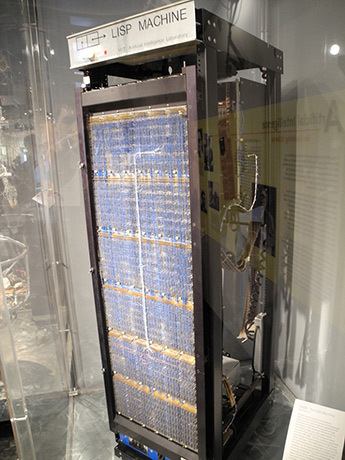 Left: a specially developed LISP-computer. 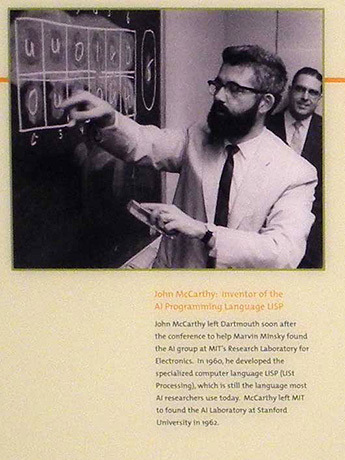 Right: the creator of LISP language John McCarthy (more information about him and his relations with the Academic Town of Novosibirsk can be found here). This is not a museum but an ordinary construction site. 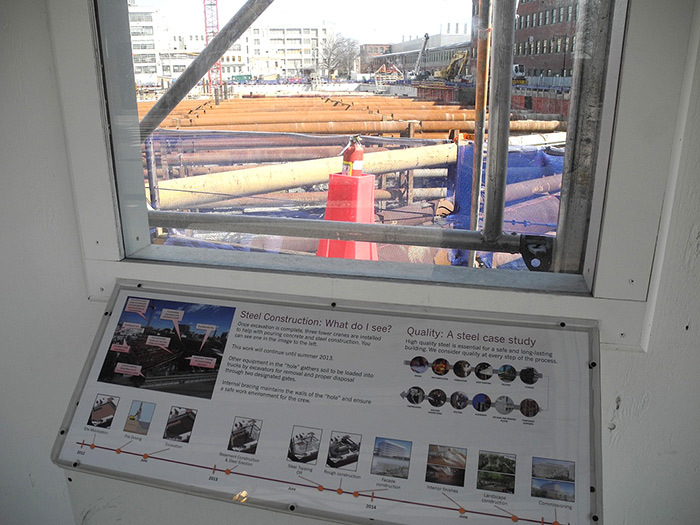 Nevertheless, any passer-by can expand one's erudition in construction and steel works by studying popular information on the stand and comparing it with the real view. Needham. 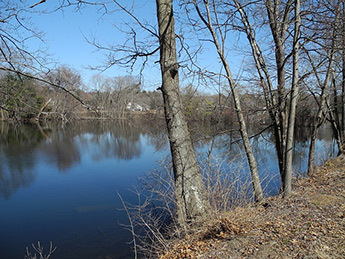 The office of LEDAS Inc. is not far from these picturesque places. PLM -highway. Left picture: Boston office of Dassault Systemes (its style is identical to the office in Velizy - a Parisian suburb). 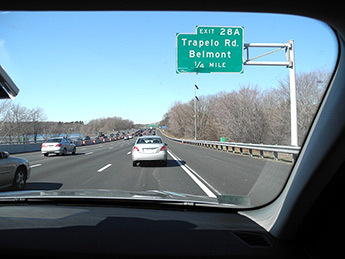 Right: exit to the road to Belmont (you can read about Belmont Technologies, a new start-up of John Hirschtick, in his interview). Boston is famous not only for its technological efficiency and CAD revolution but also for the key role in the American Revolution. 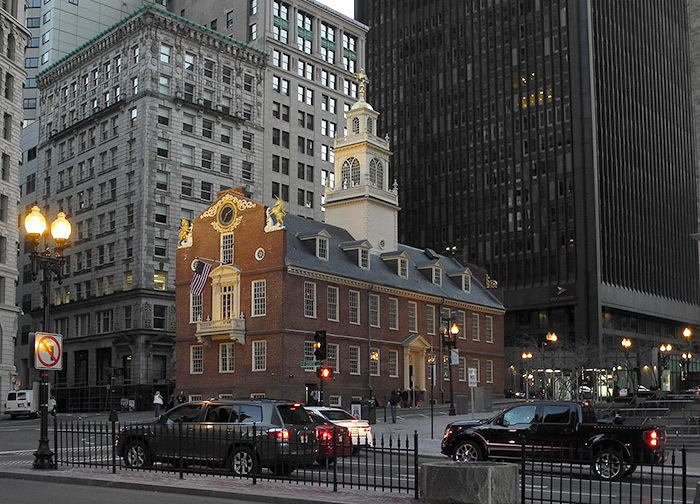 Here is th photo of Old State House. 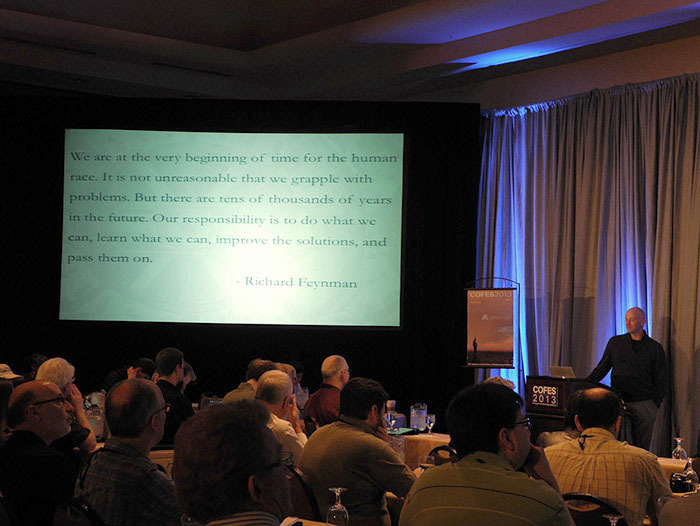 But enough of history and museums - it's time to go to COFES - to meet the future of engineering software. However, I managed to carve out one day to see the Grand Canyon. 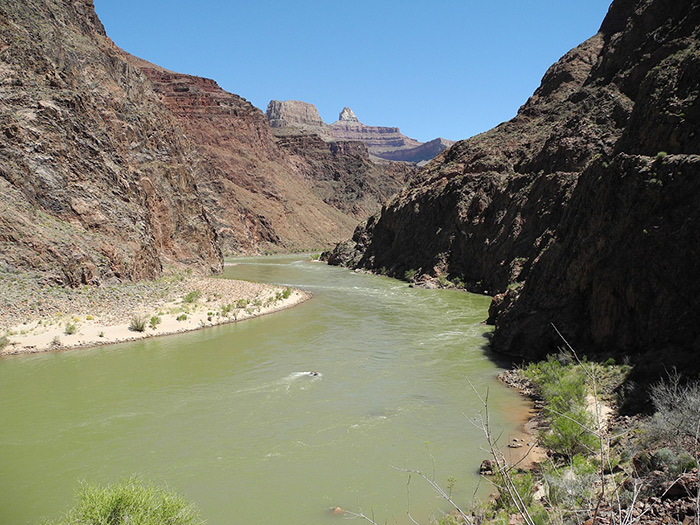 The picture shows the Colorado River and the Grand Canyon from the lower point of the Bright Angel Trail: 13 km down, 13 km up, elevation - 1300 meters; the hike took 9 hours. 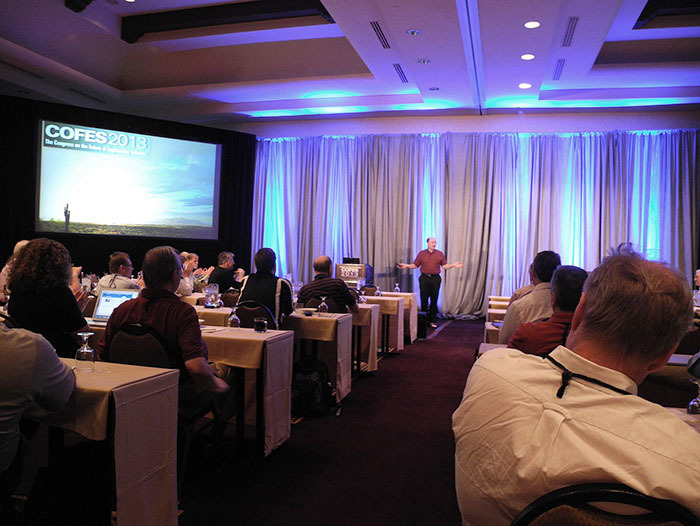 LEDAS executives already decided that the next one to attend COFES shall be obligated to take similar pictures. Warning: don't try to do that without special training and preparation! 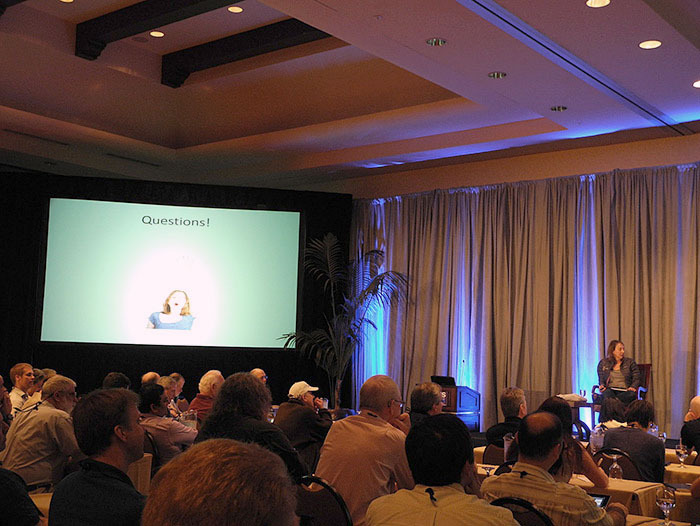 Every COFES Congress is devoted to a special theme that threads all presentations. This year the emphasis was on "Design for Resilience in Products and Strategy". In a nutshell, stability is probably good, but we must understand that it does not exist in anyhow long (or short) period of time. To live comfortably and maintain competitive ability, be ready for possible cataclysms - economic crisis and natural calamities - it is necessary to develop in oneself, one's products and one's business flexibility, steadiness and ability to adapt continuously. 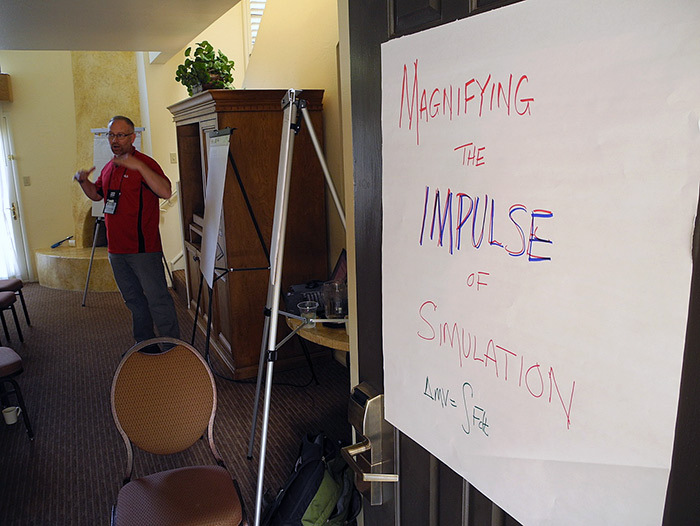 Traditionally COFES starts with a symposium on "Design and Sustainability". 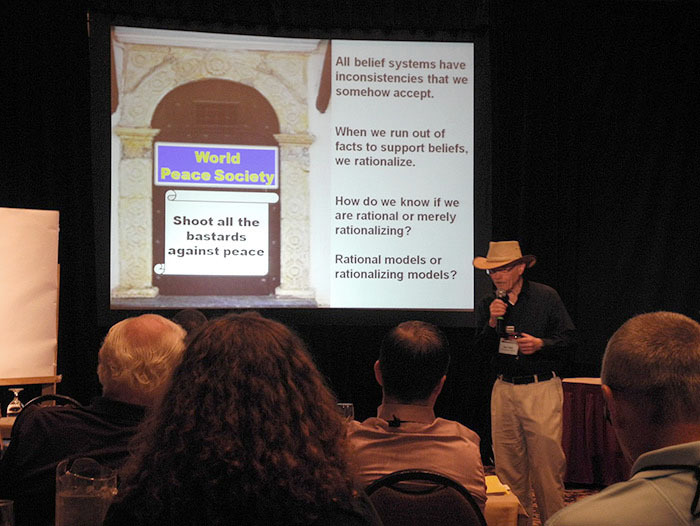 On the picture: Robert "Doc" Hall draws attention to the well-known problem of contradictory assertions: "World peace society: shoot all bastards against peace!". Brad Holtz shares the findings of current projects of Cyon Research. The presentation was confidential so taking pictures was not advised. 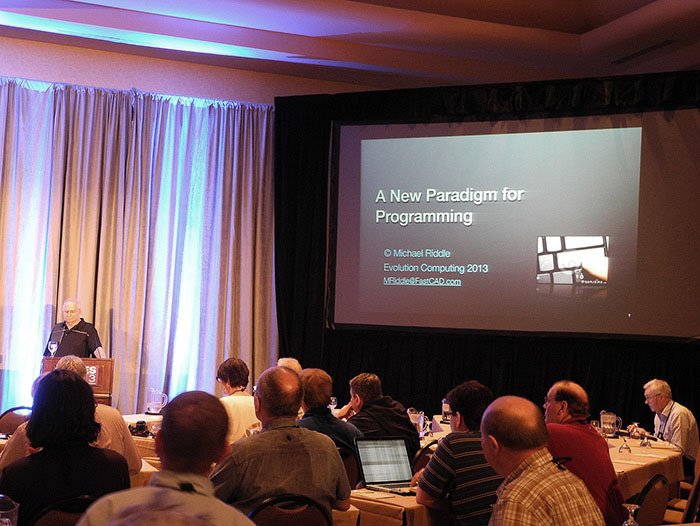 Michael Riddle, the famous author of the first version of AutoCAD, discusses his vision of the new paradigms in programming: special structuring of objects, threads, organization of multiprocessor calculations: I confess that earlier, in academic environment, I heard similar ideas and concepts. Perhaps, their time has come? 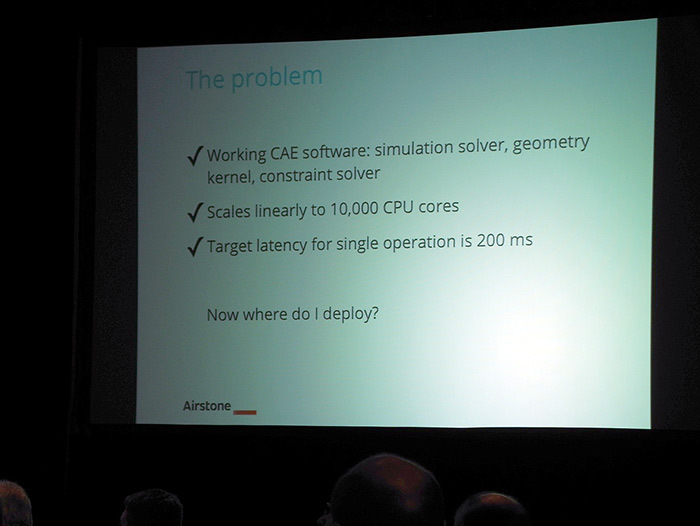 Kai Backman, the founder of TinkerCAD (a cloud CAD-application), and now a new start-up Airstone, intellectualizes about the problems of choosing servers and supercomputers for large applications for geometric modeling and engineering analysis. 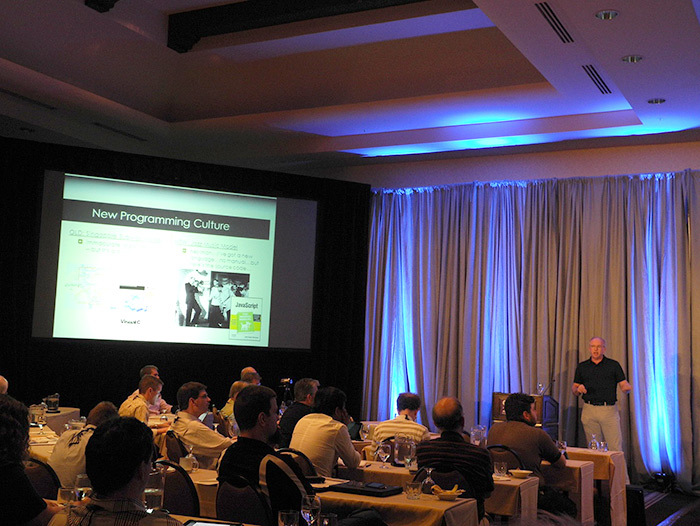 John Hirschtick, a legendary founder of SolidWorks, and now the founder of Belmont Technologies start-up talks about a new programming culture. If earlier software development resembled Singapore metro, now, probably, we have to deal with a jazz band. Why do we need musical notes, if it is possible to improvise? Why programmer's manual if there is a source code? 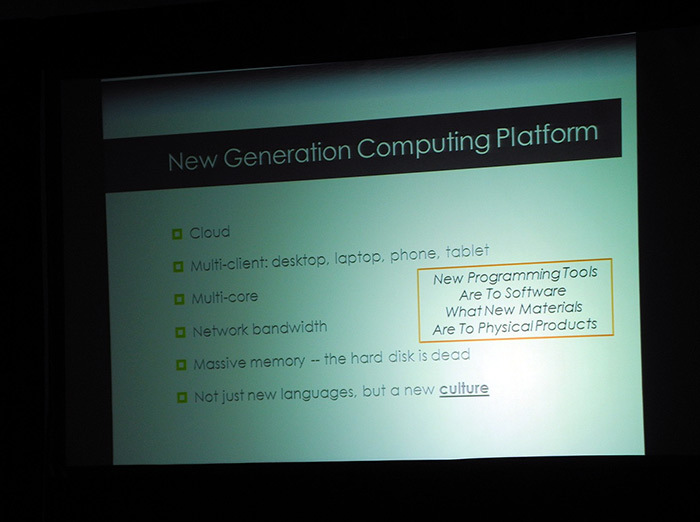 New programming tools are the same as new materials for physical products. This is, perhaps, the only mathematic formulae that I saw at COFES. Although all discussions are about the future of engineering software and the majority of participants have a solid background in mathematics and engineering, they prefer to communicate at the level of ideas, without immersing into unnecessary details of implementation. 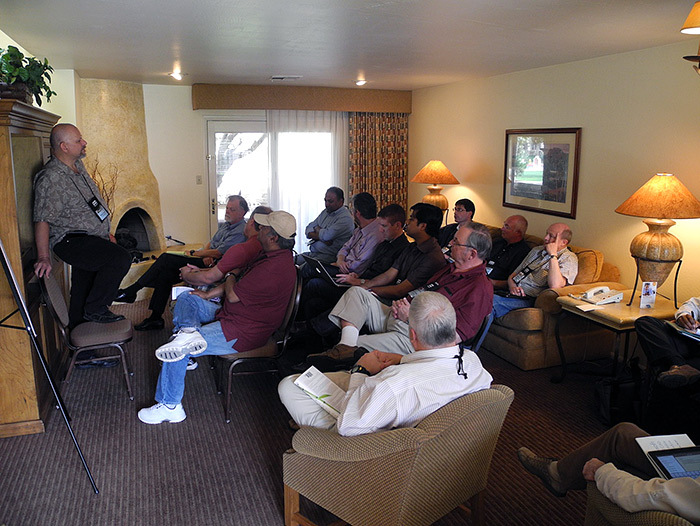 Evan Yares conducts a technological briefing about software pricing policy. BTW, recently Evan has been interested in the Russian CAD market. Let's hope that soon he'll also compare Russian and global prices. 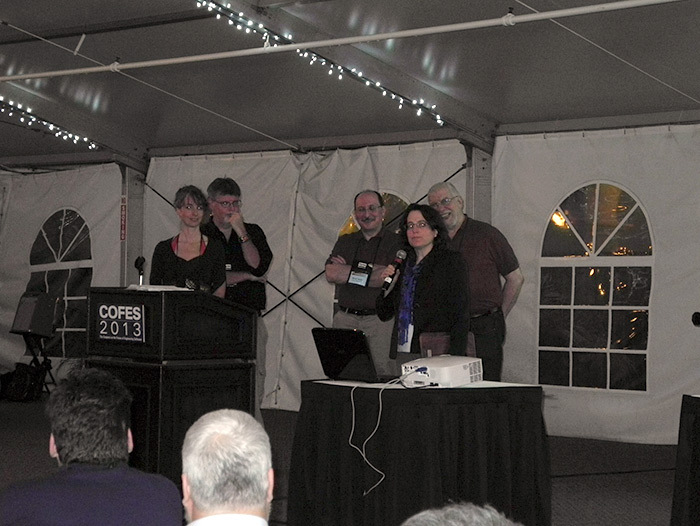 The Russian delegation at COFES comprised the record nine members. "Sergey" was one of the most popular names. 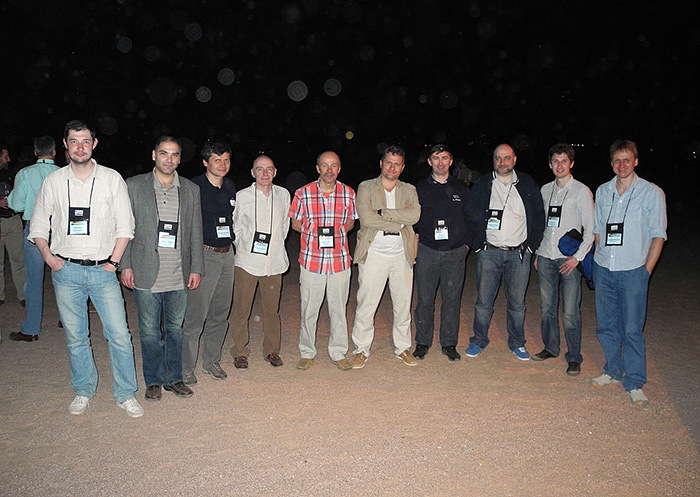 From left to right: Nikolay Snytnikov (LEDAS), David Segal (Dassault Systemes Enovia), Sergey Kozlov (Top Systems), Dmitry Popov (Nanosoft), Alexander Golikov (ASCON), Maxim Bogdanov (ASCON), Sergey Kuraksin (Top Systems), Sergey Evsikov (ASCON), Anatoly Vershinin (Fidesis) and Sergey Bikulov (Top Systems). A presentation by Esther Dyson: "When exceptions become the rule". Esther has close links with Russia (in particular, she was one of the Yandex investors, the largest web search engine in Russia and 5-th in the world). Although the presentation took no longer than 20 minutes, the interest to it was unflagging and Esther had to answer plentiful questions. "Russian engineers are engineers squared, while American salesmen are salesmen squared", Esther stated expertly. The final ceremony of CAD Society Award. At the stage - Marie P. Planchard, Director for Educational Programs, DS SolidWorks, the winner in the nomination for CAD Society Community Leader. 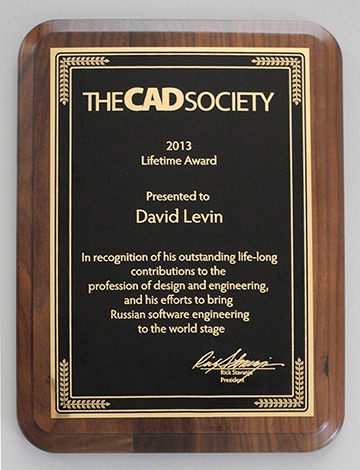 David Levin, LEDAS found and the editor-in-chief of the isicad portal received CAD Society Lifetime Award. More information can be found here. There are no competitors at COFES. There are specialists that discuss the issues of mutual interest in a friendly atmosphere. (On the picture: the heads of ASCON, Top Systems and Nanosoft). 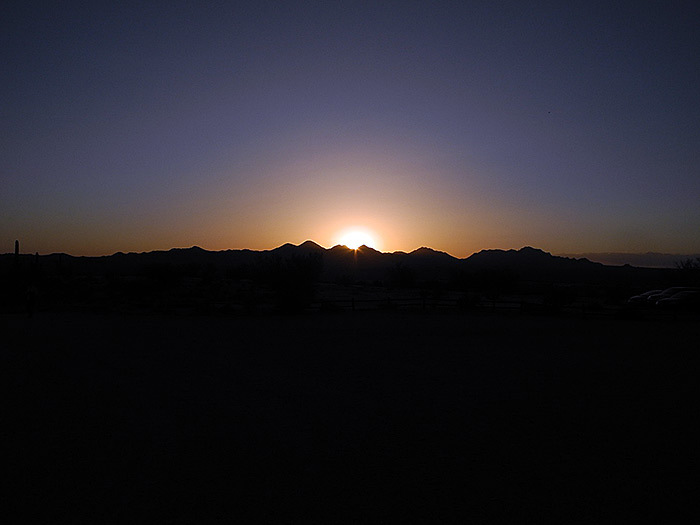 A sunset in the Arizona desert.